In this entry, the origin, context, and concept of Applied Fantasy are discussed. Developed in 2017 by Anna Mackenzie, Applied Fantasy is a way to incorporate the most positive elements of fantasy literature and media within personal approaches to well-being for sustainable and individually driven coping strategies. This entry presents the concept and examples for its use, as well as highlighting future directions and benefits from this approach. An overview is provided of existing literature that appertains to distinct elements contained within Applied Fantasy as a wider whole, including critical debates surrounding reading and watching for well-being. A key driver for this work was the publication of the All-Party Parliamentary Group (APPG) of Arts, Health and Wellbeing, Creative Health: The Arts for Health and Wellbeing (2017) that demonstrates the potential for generating productive conversations between the arts and humanities and well-being. The APPG on Arts, Health and Wellbeing was formed in 2014, aiming to improve public awareness of the manifold benefits brought by the arts and creative practices into approaches to well-being, health, and social care to inform policy and practice. This report presents the findings from discussions, research, and evidence gathering from health professionals, patients, academics, local government, and policy-makers from both Houses of Parliament. Applied Fantasy is a concept particularly aligned with the UN’s Sustainable Development Goal (SDG) 3 (“Good Health and Well-Being”) through its drive to develop sustainable, literature, and visual arts-based approaches to positive mental health and well-being. Applied Fantasy tangentially relates to the UN’s SDG 5 (“Gender Equality”) through making clear that fantasy and science fiction in all of their forms including gaming (in which activity female gamers have been targeted purely based on their gender, for example. the problems surrounding female gamers, which became known as “Gamergate” in 2014) are accessible to all people, regardless of gender. Applied Fantasy further relates to the UN’s SDG 10 (“Reduce Inequalities”) through developing and promoting an approach to well-being and positive mental health which is widely accessible and the means for which are currently in international circulation (fantasy and science fiction literature and media). Fantasy literature has long been considered beneficial for personal well-being, in providing escapism from the primary world while retaining the exploration of humanity and human character (e.g., Scarlet 2016). 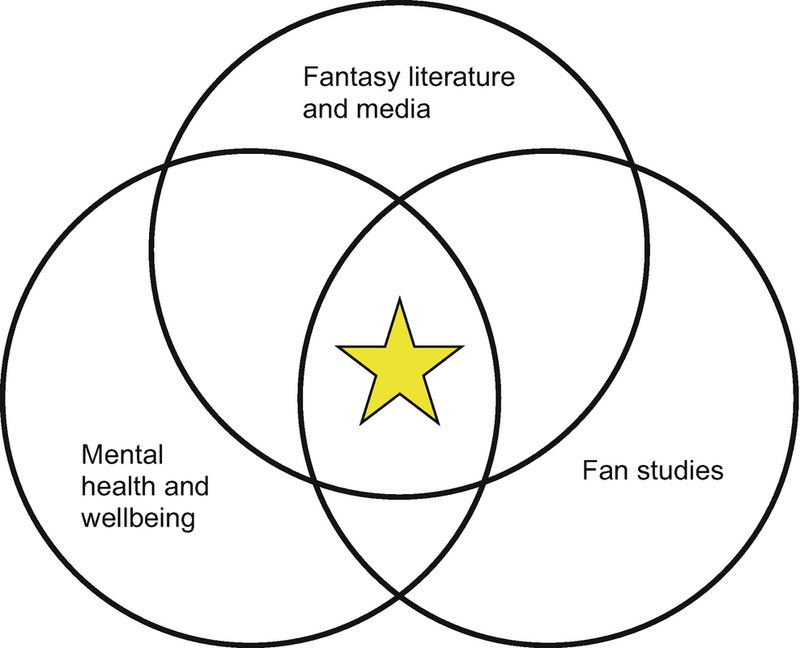 Fantasy works generate a safe space in which human behavior and experiences can be explored, as it is distanced just enough from “real life.” Applied Fantasy is a distinct point at the intersection of fantasy literature and media, mental health and well-being, and fan studies (Fig. 1). In a culture where more people are demanding that the arts are more relevant, do more for society, and have tangible benefits, it is surprising that more research has not yet been carried out on the benefits of the arts (not merely relegated to interactive arts such as dancing, painting, or singing) to positive mental health. The concept of cathartic writing has been explored over the years by a significant number of scholars, and it has been demonstrated to be beneficial for managing intrusive thoughts, overall well-being, and productivity (e.g., Chang et al. 2013; Hiemstra 2001; Seih et al. 2008). Writing can be seen as one of the interactive artistic pursuits recognized as beneficial. Conversely, reading and watching for well-being have not yet been explored. James Wines suggests that “without art, the whole idea of sustainability fails” (Wines 2008: 9). Clammer determined this “an interesting and provocative idea, since in most discourses of sustainability little attention is paid to the role of the arts […] David Korten has suggested [...] that the salvation of our society lies in the creation of what he calls ‘new stories’” (Clammer 2014: 65). New stories can exist in a multitude of forms, whether it’s the story we create for ourselves in fashioning our identities and lives, the stories we consume from literature, television and film, or our environments. As Clammer states, “We live daily in the context of buildings, objects, music, fashions, foods, décor, hairstyles, and forms of entertainment varying from film to literature to theatre, from comics to the works that we hang on our walls. […] We absorb ourselves in the artefacts and productions of popular culture” (Clammer 2014: 65). The arts, in their plethora of forms, simultaneously surround, inspire, encourage, and ground us. Fantasy, in its widest sense, takes its roots in ancient mythology, dating back to Homer’s Odyssey in c. 800BCE, moving through Beowulf (c. 700 AD), Le Morte D’Arthur (c. 1470), and A Midsummer Night’s Dream (1595–1596). Remaining an exceptionally difficult genre to define, fantasy has on regular occasion been combined with science fiction and horror to form the wider genre of “speculative fiction.” Fantasy appears a combination of mythology, fairy tales, folklore, legend, fiction, and alternate realities, rooted in magic and nonrealist forms. Science fiction, perhaps a derivative of the fantasy genre, is distinguished from fantasy through its privileging of science and technology, as opposed to magic and nonrealism. Suvin defines science fiction as “a literary genre or verbal construct whose necessary and sufficient conditions are the presence and interaction of estrangement and cognition, and whose main device is an imaginative framework alternative to the author’s empirical environment” (Suvin 1979: 37). Suvin’s nicely wide definition encompasses a significant range of works, opening up the genre to multiple interpretations. Adam Roberts admits the tantalizing lack of distinction between fantasy and science fiction, noting that “there is among all these [science fiction] thinkers no single consensus on what SF is, beyond agreement that it is a form of cultural discourse (primarily literary, but latterly increasingly cinematic, televisual, comic book and gaming) that involves a world-view differentiated in one way or another from the actual world in which its readers live”. Roberts continues to state that “some critics defin[e] science fiction as that branch of ‘fantastic’ or ‘non-realist’ fiction which is located within a materialist, scientific discourse”. The line between fantasy and science fiction has become more fragmented and blurred over recent years. Doctor Who is a solid exemplar of a phenomenon occupying both science fiction and fantasy, depending on the episode. The Deus Ex Machina theme, where the Doctor suddenly appears and saves civilizations and planets with no real explanation, is a key trapping of fantasy. Terry Pratchett, the renowned fantasy author, stated that Doctor Who is “pixel thin” as plausible science fiction: “Much has been written about the plausibility or otherwise of the Star Trek universe, but it is possible to imagine at least some of the concepts becoming real. But the sonic screwdriver? I don’t think so” (Pratchett 2010: para. 3). The hybrid genre “science fantasy” has gained more recognition in the late twentieth century as an amalgam of science fiction and fantasy (for instance, by Attebery 2010). Josh Oren describes Doctor Who as “a huge tossed salad of storytelling genres” (Oren 2012: para. 9). While there is a definitive distinction between the two genres, there are also many shared components. For the purposes of this entry and for the benefit of Applied Fantasy, fantasy and science fiction are considered two parts of a larger whole, inextricably linked in some respects and beautifully distinct in others. The “fantastic” can be seen as a tree, from which “realism,” “nonrealism,” “science fiction,” and “horror” all branch from its trunk. The foundations are similar, though the intricate details differ upon each genre’s development contingent, of course, upon its contemporary locations. Applied Fantasy is an emerging concept, stemming from the well-established form of fantasy. The approach is full of potential for mental health discourse and practices worldwide, in addition to “putting the arts and humanities to work.” Existing literature on this specific area is, therefore, lacking. There are, however, a number of areas of research already published that feed in to Applied Fantasy and provide both contrast points and areas for agreement and further work. Informed by the APPG Inquiry Report Creative Health: The Arts for Health and Wellbeing (2017), this approach for recognizing the value of arts and humanities within mental health practices builds on wider research carried out across the world. This is particularly manifested through considering the concept of the fandom for individual fantasy works and through the works themselves. Through being part of a wider community, brought together through the love of fantasy, its consumers are offered a way to negate any isolation or loneliness they experience, through feeling part of a group. The works themselves, as will be explored in this entry, provide fantastic stimuli for positive mental health, without overtly being about mental health, which is part of its appeal and beneficial potential in subverting the unnecessary but still prevalent stigma surrounding mental health. Where this approach further digresses from existing work is in its consideration of fantasy media (film, television), gaming (video games, particularly), and private reading. Key distinctions from the APPG report include valuing private leisure pursuits including reading alone and watching television or film. The APPG report cites television viewing as a “sedentary leisure pursuit,” from which children should be “divert[ed]” (APPG 2017: 93). One of the main omissions in the APPG report is how to navigate the differences between watching television/film and reading alone, as both practices can be defined as “sedentary.” The APPG report also highly values the practices of reading aloud, or “shared reading,” but does little to recognize the benefits of private reading. As the Report notes, “the work of the Reader [organisation] involves group reading of literary works by people experiencing physical and psychological pain [and] seems to be effective precisely because of its verbal nature” (APPG 2017: 40). While the Report notes that “The Mental Health Foundation advises reading books […] as a way to preserve mental health in older age” (APPG 2017: 124), this activity is not pursued with such alacrity and afforded as much prominence as reading aloud. Maya Angelou is quoted in the Report saying: “When I look back, I am so impressed with the life-giving power of literature. If I were a young person today, trying to gain a sense of myself in the world, I would do that again by reading, just as I did when I was young” (APPG 2017: 84). As Wilson et al. explored in “Life-span cognitive activity, neuropathologic burden and cognitive aging,” reading on a regular basis improves and sustains cognitive function, with fiction boosting personal creativity and fostering a more open mind (Wilson et al. 2013). Within mental health discourse, activities within private time are a significant component. The concept of self-care has become more prevalent and mainstream, particularly in the last 5 years. The idea essentially legitimizes “alone time” and recognizes the value in taking time for oneself without any feelings of guilt. A further omission within the APPG report is the importance of private (solitary) leisure activities. What we do in our private, alone time is an incredibly personal choice. We have all been there when we have channel-hopped or picked up a book then chosen another because it just didn’t “feel right” for that particular moment. Applied Fantasy recognizes the importance of our private leisure activities as well as watching/reading/playing fantasy in our own time. A respondent within Granneman’s The Secret Lives of Introverts: Inside Our Hidden World noted that “Introverts gain energy from solitude. […] I play games on the computer or watch Star Trek. Basically[,] any escapist behaviour. I recharge ten times faster if I’m engaged in something fantastical” (Granneman 2017: 112). As such, fantasy provides a highly suitable focus for self-care (also see the entry on “Drama and Theatre for Health and Wellbeing”). Challenging the widespread view that television wields a negative force in people’s lives, Guillen-Royo’s 2018 study of “Television, Sustainability and Subjective Wellbeing in Peru” demonstrates that in moderation (as with most activities/consumption/practices), television viewing presented as a positive force in the South American subjects (Guillen-Royo 2018). Guillen-Royo chronicles the many studies that cite over-consumption (or continual binge-watching) as a driving force for the negative view of televisual viewing, demonstrating through recent research that “television can be a source of wellbeing” (Guillen-Royo 2018: 1). She further differentiates between attitudes toward sustainability and well-being, stating that “the main result of this study concerns the fact that greater consumption of television reduces individuals’ sustainable attitudes but not their wellbeing” (Guillen-Royo 2018: 16). Cohen discusses the relative benefits of binge-watching television shows through gaining the “flow experience” and increased well-being through watching episodes back-to-back (Cohen 2017). Fleming et al. produced the first study on “serious games and gamification for mental health” in 2017, primarily focusing on the potential for mental health benefits through exergames, virtual reality, cognitive behavioral therapy (CBT)-based games, entertainment games, biofeedback, and cognitive training games (Fleming Theresa et al. 2017: 6). The 2016 collaborative project “The Rest Test” (devised by the Wellcome Trust, Hubbub, and Durham University) was completed by more 18,000 people from 134 different countries. Respondents were asked to select from a list of 25 activities those that they considered most restful: reading was the most popular option, with watching television ranked tenth most popular. As Hammond and Lewis note, “many of the most popular activities suggest escapism, either from other people or from the built environment” (Hammond and Lewis 2016: 62). The work carried out by these researchers within television, gaming, and “The Rest Test” demonstrates that there is a keen need for in-depth exploration of reading and watching for well-being. The stark gap in the literature evidences a niche area for scholarship, drawing together disparate areas of research for the first time in the pursuit of the Applied Fantasy approach. Recognizing the solitary leisure pursuits within “The Rest Test” highlights the proportion of individuals turning to reading and television for restful activities. Finally, a key area of focus is to contextualize this research within fan studies, relating the individual to the wider social grouping they seek out through the fandoms. Within the wider concept of the specific “fandom,” there are subsets that value within this fandom certain eras, incarnations, forms of media, or representations over others. For example, Doctor Who fans can be distinguished by their preference of either “Classic Who” (1953–1996), Nu-Who (2005–present), or the complete Whovian canon from 1963 to the present day. Jenkins posits that research into the fandom exposed “participatory cultures are characterized by commitment to access, expression, sharing, mentorship, the need to make a difference, and the desire for social connections” (Delwiche, 2013: 11). Matt Hills explored fandom as a “cult” or a form of religion (Hills 2002: 28); Lévy considered fans as a form of “collective intelligence,” sharing individual intelligence and beliefs through collaboration (Lévy 2013: 99). As Jenkins states, “fandom remains a space where a commitment to more democratic values may be renewed and fostered. Noncommunal behavior is read negatively, as a violation of the social contract that binds fans together” (Jenkins 1992: 282). The communal nature of fandom is an intrinsic part of its being. To set out the possibilities and potentially significant benefits for this approach, this entry sets out four examples considering works of literature, television, film, and manga. It is argued that Applied Fantasy works through two distinct ways: (1) First, the texts and media present readers and watchers with practical guidance for positive mental health and coping strategies without overtly being about mental health. This offers an approach that is less obviously about mental health itself but rather about popular culture and cult (global) enjoyment of these phenomena. (2) Second, the works under consideration tap into a significant and extensive fandom. The positive strategies for mental health care can benefit from this social aspect, of being part of something, partaking in the fandom and feeling a member of a group united through enjoyment. For example, even 20 years on from the publishing of the first in the series, Harry Potter still occupies a prominent and key role within contemporary culture; fans can be sorted into their Hogwarts Houses through online quizzes, further emphasizing their sense of belonging. Such processes echo other therapeutic and education approaches which prompt engagement with nonfiction storylines as part of a wider collective (Wall and Jarvis 2015; Wall 2016; Wall et al. 2017, 2018 forthcoming; Hindley and Wall 2018; King 2018 forthcoming; Wall and Meakin 2018 forthcoming). See the following entries within the Encyclopedia of the UN Sustainable Development Goals. Good Health and Well-Being for a more detailed discussion of other arts-based interventions for health and well-being: Creative Writing for Health and Wellbeing; Drama and Theatre for Health and Wellbeing). The case studies chosen for this entry come from literature (the Harry Potter series), television (Doctor Who), film (the Divergent Trilogy), and manga (Paprika and Suicide Island). These media all differ significantly both in their formats and their transmissions but outline potential areas for exploration, elaborating on salient points particularly relevant to the considerations surrounding reading/watching for well-being and the relative fandoms. As literature, the Harry Potter books are visually consumed, with additional tactility in holding the book/Kindle/iPad and turning the pages on a book; Doctor Who, as a television series, can be watched visually and audibly for one episode (approximately 45 min each) or watched back-to-back (“binge-watching”). The Divergent films each require a longer period of concentration (the first film is 2 h, 19 min in length), and Paprika as a manga series is an image-rich medium in panels most frequently designed to be read right to left with the art complemented by the text, as opposed to the text being complemented by the art. The bildungsroman nature of the Harry Potter series immediately presents readers with an outsider, in direct and unsubtle conflict with society, presented microcosmically by the Dursley family. As soon as the first page readers are presented with the concept of Harry as ostracized from the perceived normality of muggle life, “The Dursleys knew that the Potters had a small son, too, but they had never even seen him. This boy was another good reason for keeping the Potters away; they didn’t want Dudley mixing with a child like that” (Rowling 1997: 7). The deictic marker “that” implied distance and disdain, something outside what the Dursleys consider “normal” human behavior. This is an attitude upon which Petunia Dursley expands in Chapter 4 of “Harry Potter and the Philosopher’s Stone,” where she tells Harry “I knew you’d be just the same, just as strange, just as – as – abnormal” (Rowling 1997: 44). Harry Potter presents readers (and watchers of the films) with a range of characters who have had to overcome significant trauma, bullying, exclusion, loss, neglect, and misunderstandings about who they are. Not only Harry but most of his friendship group has experienced at least one of these difficulties, meaning that Harry is no longer isolated in his feelings. In its widest sense, the Harry Potter novels champion acceptance, tolerance, encouragement of differences, and the explosion of stigma. Tapping into the British boarding school tradition of novels, the Harry Potter series shows the protagonist suddenly located in a brand new world full of startling new ways and objects and is expected to quickly adapt. Harry’s process of adapting gradually can give socially isolated people a glimmer of hope in approaching new situations slowly. Harry’s interaction with Draco Malfoy on the train to Hogwarts in the first book demonstrates distance between peers. This theme is continually built on throughout the novels through criticism of the Weasleys for their poverty, bullying of Hermione Granger for being muggle-born, and students not engaging with Luna Lovegood because she was different. The perfect microcosm of contemporary society is built within these novels. The Boggart in Harry Potter can be read as presenting an approach to managing conditions such as anxiety and depression. A shape-shifting creature, the Boggart reads the mind of the person facing it, turning into a representation of the thing/person/animal they fear the most. Professor Lupin reveals that “Boggarts like dark, enclosed spaces [:] wardrobes, the gap beneath beds, the cupboards under sinks” (Rowling 1999: 101). The Boggart is presented as the archetypal primal fear, the “thing under the bed,” lurking in the dark. As Lupin says, “It’s always best to have company when you’re dealing with a Boggart” (Rowling 1999: 101). To defeat the Boggart, the person facing it has to use their mind and imagination to turn it into something they find amusing. Neville Longbottom, for example, feared Professor Snape the most; at Professor Lupin’s encouragement, Neville was able to imagine Snape in Neville’s grandmother’s clothes as he used the charm, “riddikulus!” (Rowling 1999: 102). Neville clearly brought to mind his grandmother’s outfits: “Always the same hat. A tall one with a stuffed vulture on top. And a long dress… green, normally… and sometimes a fox-fur scarf” (Rowling 1999: 102). The imposing Snape appearing from the wardrobe suddenly changes with Neville’s powerful thinking combined with the charm: “Snape stumbled; he was wearing a long, lace-trimmed dress and a towering hat topped with a moth-eaten vulture, and swinging a huge crimson handbag” (Rowling 1999: 104). In introducing the Boggart, Lupin said “the charm that repels a Boggart is simple, yet it requires force of mind,” telling Neville to “raise [his] wand – thus – and cry “Riddikulus” – and concentrate hard on your grandmother’s clothes” (Rowling 1999: 102). A staple of cognitive behavioral therapy is a practical worksheet on which patients can physically contradict negative thoughts by outlining the evidence against a negative thought. This results in the thought not being repressed, which can be unhealthy, but by actively disproving the thought. A thought diary provides a structure for people to track their negative thoughts and work through them. Listing the negative thought, accompanied by the emotion felt and the evidence for and the evidence against the negative thought, encourages the person to disprove the negative thought and come up with an alternative thought. This diary sets the individual the task of objectively challenging negative thoughts by physically writing down the evidence for and against the thought. In a number of cases, the “evidence for” column is significantly shorter than the “evidence against” column. Of course, this does not automatically rid people of negative thoughts, but it is a step toward changing mind-sets in a sustainable way. In the case of Harry and the Boggart, the students (and, indeed, Professor Lupin) have to challenge the fear head on and change it into something not only positive but amusing. This has the power to vanquish the Boggart. Thought challenging is also like being the judge in your own court case. The defendant is your negative automatic thought, for example ‘everyone hates me’. When presenting the evidence that supports this, how reliable and robust is it? ‘Everyone hates me, I just know it’ is that good, strong enough evidence? Consider all the evidence and create your own verdict by using an evidence based alternative thought. In offering a different approach, based within imagination rather than involving any physical activities to challenge the thought, all learning and processing abilities are catered for. Additionally, assigning the metaphorical judicial role to the person challenging the thought can endow the person with a sense of importance in tackling the negative thought. The Boggart, although appearing to be a fantastical creature set apart from reality, actually embodies (through its method of defeat) exceptionally important processes for positive mental health. Television has been seen as an unhealthy leisure pursuit. Decried in the APPG report as “sedentary” and therefore negative, television did not come under any real consideration in beneficial media (APPG 2017: 93). Television, though, is so prevalent in contemporary society. Akin to private reading, choosing a television show to watch in private time is a personal choice, and viewers will often pick a show or series with which they connect at that particular moment in time. Binge-watching has come under significant criticism, with the practice attracting almost wholly negative attention (presumably due to its sedentary nature, while depriving the viewer of fresh air, exercise, or vitamin D). However, binge-watching (while not a traditionally “healthy” pursuit) actually offers some health and well-being benefits. Cohen states that “when individuals binge watch, they are thought to have what’s called a ‘flow experience’. Flow is an intrinsically pleasurable feeling of being completely immersed in a show’s storyline. […] We need to shake the notion that bingeing on stories we engage with on TV is somehow [a] less worthy leisure pursuit than bingeing on stories that we consume [in] other ways, like novels” (Cohen 2017: para. 19). In determining lack of physical movement a negative activity, television (like reading, which ironically does not attract such criticism) is denied any positive emotional or mental impact. As Cohen notes, stories through the medium of television are deemed less worthy than stories through the medium of books. The British TV series, Doctor Who, occupies a space traversing both fantasy and science fiction. The series 8 episode “Into the Dalek” (2014) presents viewers with a daunting prospect: the Doctor and companions being miniaturized and inserted into a Dalek to fix its memories. A Dalek has seemingly “turned good” after seeing a star being born and realizing that life continues and evolves, even after destruction; after treating the Dalek for radiation, the Dalek reverts to traditional Dalek behavior, exterminating every life form different to itself. In search of the Dalek’s specific memory of the star being born, the catalyst to its reevaluation of Dalek priorities, the Doctor and his companions find a chamber with what appear to be strip lights. This is the cortex vault, “a supplementary electronic brain. Memory banks, but more than that. […] The radiation allowed it to expand its consciousness, to consider things beyond its natural terms of reference. It became good” (“Into the Dalek” 2014). The hidden memory of the star being born is visually represented through dark areas in the cortex vault, which Clara Oswald (the Doctor’s friend and companion in the TARDIS) and Journey Blue (a pilot in the Combined Galactic Resistance) sought out to reactive. “CLARA: So, the Doctor said this was a memory bank and some of the memories were suppressed. What if. What if the dark spots are hidden memories? What if one of those is the Dalek seeing a star?” (‘Into the Dalek’ 2014). This representation of the “good Dalek” and its prompt to become “good” are all based on one memory, of a star being born. The visually rich image of the light and dark memories clearly expresses the concept of repressed/hidden memories. Depicting memories in this way can make them seem more tangible, more real, and prompt watchers to consider their own repressed memories, with a view to “turni[ng] [them] back on” (“Into the Dalek” 2014). DOCTOR: You want weapons? We’re in a library. Books! Best weapons in the world. This room’s the greatest arsenal we could have. (He throws some books to Rose). The concept of a library being the “best arsenal in the world” is proven through the discovery of a book on mistletoe and a shooting star falling to earth in 1540 with the early cell/s of the werewolf. Books are a limitless source of inspiration, comfort, and encouragement. Film clearly differs from television in the manner in which it is transmitted, in one continual presentation, as opposed to shorted episodes in a series. Akin to fiction presented without chapters, this format allows uninterrupted flow and a more concentrated exposure to the contents of the film. Viewers are effectively swept up into the film and only released upon the conclusion of the film. The Divergent Trilogy (2011–2013) presents a dystopian, futuristic version of Chicago where, upon reaching adulthood (age 16), each member of society must choose to belong to one of the five factions: dauntless, amity, erudite, abnegation, or candor. The story of Tris Prior can resonate with not only young adults and teenagers but also anyone reevaluating their place in the world and choosing their direction. Dominus stated that the trilogy “explores a more common adolescent anxiety – the painful realization that coming into one’s own sometimes means leaving family behind ideologically and physically” (Dominus 2011: para. 5). This concern does not only exist within adolescents but is applicable to people of any age. Removing the age-specific reference here, and making the concept wider, reveals that individuals can forge their own paths, away from what is expected and within the “social norms,” disregarding labels and assumptions. The concept of aligning character traits with individual identity is explored in other science fiction/fantasy works. Spenser’s The Faerie Queene (1590) offers an early representation of this, with knights embodying certain virtues: the Redcrosse Knight embodied holiness and Britomart embodied chastity, for example. The individual choosing their faction, however, places the onus upon the individual’s self-awareness of their skills, limitations, and also, importantly, who they want to be. The concept of the factions is to fulfill certain roles in society. If individuals cannot fulfill these roles within the designated parameters, they are cast aside, becoming “factionless” and losing their place in the society. Tris eventually realizes the futility of reducing people to their strongest virtue and chooses to become factionless, embracing her Divergent state, discarding the prosaic concept, and choosing her own path. As Tori observes of Tris, “You’re different. You don’t fit into a category. They can’t control you. They call it Divergent. You can’t let them find out about you” (Divergent 2014). Tori’s fear for Tris not conforming sharply contrasts with Tris owning her divergent state later in the film: “Don’t try and define me,” ending the film with “We’re like the Factionless now. We’ve left everything behind but we found ourselves and each other” (Divergent 2014). Garcia describes the trilogy as exploring “the grasp of power between youth and adult authority” (Garcia 2013: 71). Again, the concept of authority is not inextricably linked with age relations but applies to any relationship. The concepts are highly transferable and applicable to identity construction and self-awareness within societies that assert their expectations to the peril of individual identity. Manga artists construct manga in a wide range of genres, with fantasy retaining popularity among artists. As a different form to the Western “comic book,” the experience of engaging with manga, either physically or on a computer screen, differs to literature. Manga characters are instantaneously recognizable and remain consistent across artists and forms, with manga faces (enormous eyes almost bursting with tears, pointed chins, and small mouths except when smiling). Cohn determines this “Japanese Visual Language (JVL)” (Cohn 2010). Rozema observes that “a manga face always looks like a manga face, making them easy for adolescents with Autistic Spectrum Disorder (ASD) to recognize” (Rozema 2015: 62). At a visual level, adolescents with ASD (determined by Grandin as “visual thinkers” (2013)) can respond automatically to format, a consistent pattern and denotation of characters and panels. A further aspect in manga characters’ appeal is their adherence to primary emotions without nuanced secondary emotions. Scott McCloud identifies six primary emotions which can be expressed by human faces: anger, disgust, fear, joy, sadness, and surprise (McCloud 2006: 83). In manga, these emotions are very clearly written on the faces and postures of characters, with joyful characters beaming and sad characters with tears streaming down their cheeks. For individuals with ASD, this is a welcome clarity in expression; for others with non-ASD mental health conditions, the consistency of panels or representation can offer a sense of constancy in life. In a way, relegating character expression to the basic six emotions (even though this is a technical decision, not an emotional one) can encourage readers’ reflections on their own feelings and exploration of where these emotions originated. Manga can offer a simplified form of emotion in a consistent pattern and a significant fan base that can appeal to readers. Paprika (manga adaptation of a novel, created by Reiji Hagiware in 1995) explores dream therapy through a psychotherapy (PT) device, allowing the psychiatrist Dr. Atsuko Chiba to enter clients’ dreams and sometimes perform treatment within their dreams. In the early stages of development, “PT” devices were deemed dangerous and banned; Dr. Chiba created an alias or cover identity named Paprika to carry on the work with clients under the ban. A new device (the “PT mini”) is stolen while in the testing stages, and the thief is using the device to “infect” the research institute with schizophrenia, prompting Paprika to engage in bottle in the world of dreams. Dream therapy through PT devices is a Jungian, futuristic scientific process which taps into contemporary therapeutic technologies, including hypnosis, treatment for dissociative fugue, and dream analysis. Paprika presents the worst-case scenario with the device being weaponized, which simultaneously highlights the power inherent in the PT work and its potentials for positive benefit. Dreams play a key part in individual mental health and emotional processing, with REM sleep reactivating emotional and memory-related structures during dreams, allowing people to reprocess upsetting memories in an environment free of a key stress chemical. (Walker and van der Helm 2009). Threats to the dreams of the institute’s employees constitute a serious concern, while the morality of the PT device is called into question. Interrogating Paprika through its artwork and text in conjunction with research into dreams and emotional processing could reveal further beneficial connections. Suicide Island (2008 – present manga series) develops a parallel existence where young men and women who attempted to commit suicide are noted in a “suicidal recidivist list” and removed to an isolated island. Sei, a teenager, is sent to the island after attempting suicide through an overdose. He is told by the attending doctor, “Now that you’ve given up your obligation [to live], it means that you’ve also given up your right” (Mori 2008). The only rule of the Island is to not escape. Upon arriving at the island, Sei and the other inhabitants find a sign that states: “Everyone on the island, you have given up your right and duty to live so therefore you were placed on this island. You are marked as dead in our country, therefore your ID in this country has been taken away. Our country has no reason to protect your rights as human beings anymore” (Kouji 2008). This is signed by the Japanese government. Harding observes that depression was not widely recognized in Japan until the late 1990s. Following the evolution in Japan’s medical tradition, from primarily physical to a combination of psychological and physical, people diagnosed with kokoro no kaze (“a cold of the soul”) doubled in 4 years. “Japan’s leaders were rattled. Mental illness had gone from a hush-hush family matter to the focus of a workers’ movement” (Harding 2016). Suicide Island, then, parodies the Japanese government’s response to depression and mental ill health while exploring the individual mental health of its characters. Following the progress of the inhabitants on the microcosm, that is, the island, offers readers some insight into recovery from suicide attempts while not “fixing” all of the characters’ lives. Combining this subject matter with a parallel existence within the enticingly simplistic form of manga makes the subject of suicide more accessible. Running from November 2008 to August 2018, Suicide Island’s circulation in Japan was 1.5 million copies in October 2012, showing that it had a keen audience and conceivably a loyal fandom. Comprehensively locating the aims and approaches for Applied Fantasy within global health and well-being priorities including the UN’s Sustainable Development Goals. Applied Fantasy, with its focus on the use of literature and arts from science fiction and fantasy, offers approaches to health and well-being that not only tap into well-established media but also that motivate sustainable behaviors for good mental health and well-being. Surveying the disparate forms of media and work on fan studies and fantasy to establish a comprehensive framework and methodology to direct future study, traversing mental health therapeutic treatments and literature calling on expertise from the fields of health and social care, psychology, art and design, and fan studies. Developing more extensive empirical work which utilizes health and well-being instruments in relation to fantastic stimuli and sustainability. Incorporating other media such as cyber-gaming and board-gaming into the field, which will require further input on other formats of fantasy that have not yet been identified for research. This area relates to the UN’s SDG 5 “Gender Equality,” where the gender of female gamers within particularly fantasy games has proved an obstacle to equal treatment with #Gamergate (2014), discussed within multiple explorations of sexism within the gaming industry (e.g.,, Bryce and Rutter 2003; Fox and Tang 2014; Kaye and Pennington 2016). Exploring the implications of format and transmission of fantasy works upon the benefits for mental health, for example, generating data relevant to film, television, books, manga, cyber-gaming, and board-gaming and exploring the relative benefits of each form of fantasy (gaming, in both formats, presents an alternative approach in cyber-gaming often being a solitary activity but connecting with other players over the internet; board-gaming is clearly a multiplayer, in-person pursuit). In practice, it is likely that Applied Fantasy will be developed in relation to wider health care and educational activity, perhaps alongside wider social prescribing of creative and arts practices, where arts-based activities replace, at least in part, other forms of health care such as therapeutic approaches and medication. Part of these developments relies on evidencing and establishing Applied Fantasy as a beneficial tool for well-being and positive mental health. In outlining possible case studies and approaches, this entry gives a snapshot into the breadth of the emerging concept. Most importantly, this is an approach for everyone, with accessibility and sustainability driving the research, aligning with the UN’s SDGs. The impact of the arts on contemporary culture and life has been underestimated, and as Clammer states, “our lives are saturated with the arts and their products material and immaterial: they are at the core of culture. They not only provide the substance of much of our lives (and provide livelihoods for many millions), but are also the sources of empowerment, identity building, skill development, utopian visions and social and cultural alternatives, but also, and very importantly our fantasy or imaginative lives” (Clammer 2016: 48). The power of literature and media to tap into sustainable mental health and well-being practices is significant. Linking the works with consideration of fan psychology, community building, and therapeutic and psychological approaches to mental health will present a sophisticated and comprehensive new approach to individual mental health which, most vitally, motivates positive and sustainable behaviors for all.